Principal Cast : Marlene Dietrich, John Davis Lodge, Sam Jaffe, Louise Dresser, C Aubrey Smith, Gavin Gordon, Olive Tell, Ruthelma Stevens, Davison Clark, Erville Alderson, Phillip Sleeman, Marie Wells. Synopsis: A German noblewoman enters into a loveless marriage with the dim-witted, unstable heir to the Russian throne, then plots to oust him from power. This very loosely based-in-truth biopic of Russian Empress Catherine The Great may not hit the beats modern audiences expect, nor delve too deeply into the social and political evolution of Russian aristocracy, but as an example of artistry and style The Scarlet Empress is a magnum opus from cinematographer Bert Glennon and production designer Hans Dreier, both of whom combine stark fantastical set-pieces and exemplary visual tones for Josef von Sternberg’s hugely ambivalent film. 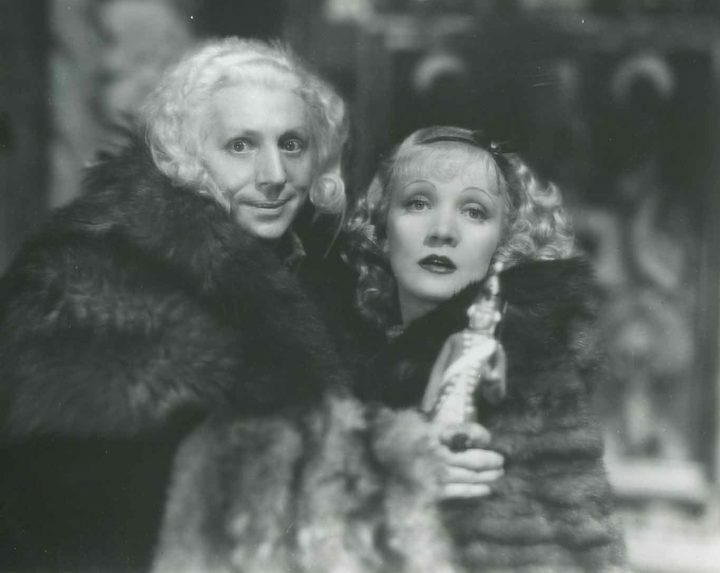 Exactly how much of the film’s story is actually true (here, Catherine’s husband, Peter III, is portrayed by screen debutante Sam Jaffe as a halfwitted simpleton, whereas modern thinking suggests as more complex character) isn’t really the key to penetrating the film’s suggested opulence, and for once it isn’t Marlene Dietrich’s camera-hogging performance in the title role that makes the movie work. 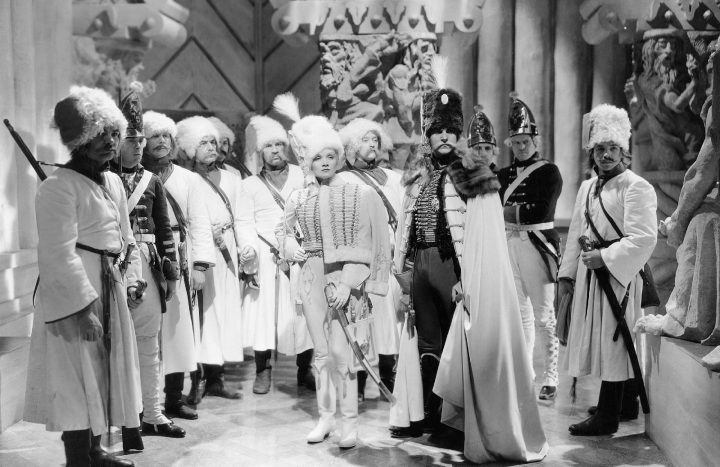 Russian Empress Elizabeth (Academy Award nominee Louise Dresser – A Ship Comes In) is desperate for her heir, the dullwitted Grand Duke Peter (Sam Jaffe – Gunga Din, Ben Hur) to have a son in order to prolong the family’s legacy as rulers of their country. 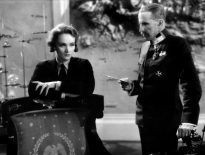 The Empress chooses German-born aristocrat Princess Sophie (Dietrich) to marry her son, with the young woman initially enthusiastic about the idea. She is taken from her home to Moscow by adjutant Count Alexy Razumovsky (John Davis Lodge – Bank Holiday), a handsome and charismatic member of the Court. The Empress, a controlling and hot-tempered ruler, demands a son of Sophie, who despises her intended husband, conflict arises; she finds solace in the arms of many suitors, with exceptional feelings found for the Count. When the Empress eventually dies, and Duke Peter ascends to the throne, Sophie – renamed Catherine by her mother-in-law – begins to plot his downfall and her own rise to power. Intrigue and subterfuge are the order of the day in this highly stylised historical epic from Josef von Sternberg, where the grotesque and ornately satanic imagery surrounding the film’s cast suggest an almost supernatural dread across the story. 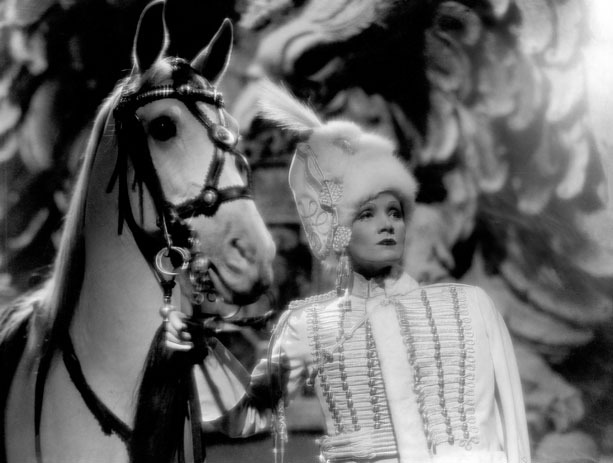 Marlene Dietrich’s central character, Catherine The Great, is a bewitching ingenue upon whom the fate of Russia rests, and the actress certainly plays up the best parts of the historical figure’s sense of pervasive sexuality. 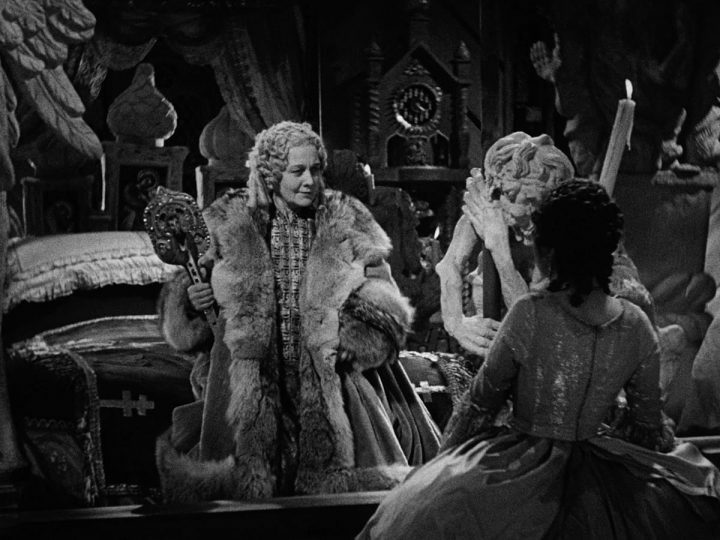 The film delights in an evocative visual language, the sprawling sets populated with many disfigured and devilish statues (in reality, the Russian Orthodox Church, to which Empress Elizabeth belonged, did not believe in such overt imagery at all) and the costume design and candlelit set dressing establishing the pompousness of it all. Russian Royalty was a cutthroat affair (aren’t they all, though?) and thanks to Eleanor McCreary’s salacious screenplay, which downplays realism in favour of melodrama and spurious assertion, we’re front and center for the best of it. As always, the camera absolutely adores Dietrich, with von Sternberg lavishing the film with her face at every possible opportunity, and the actress’ work here, despite a screenplay offering a fairly generic and condescending character part, is really well done. John Lodge, whose roguish good looks imbue his Count Razumovsky with the appropriate level of attractiveness alongside Jaffe’s jut-jawed, bug-eyed Grand Duke Peter, is elegant leading man material, but he’s window dressing to Dietrich and the far better actors around him, notably Louise Dresser. Dresser’s Empress Elizabeth has the same withering personality as her namesake royal in Shakespeare In Love (although Judi Dench was playing the English Queen, not the Russian one) and absolutely tears the film apart with her electrifying work. It takes a lot to command the screen in Dietrich’s presence, but Dresser accomplishes this with ease. Supporting cast members such as C Aubrey Smith, as Princess Sophie’s father, the conniving Ruthelma Stevens (playing one of Peter’s groupies), and Gavin Gordon, as a Russian military captain, do solid work also. 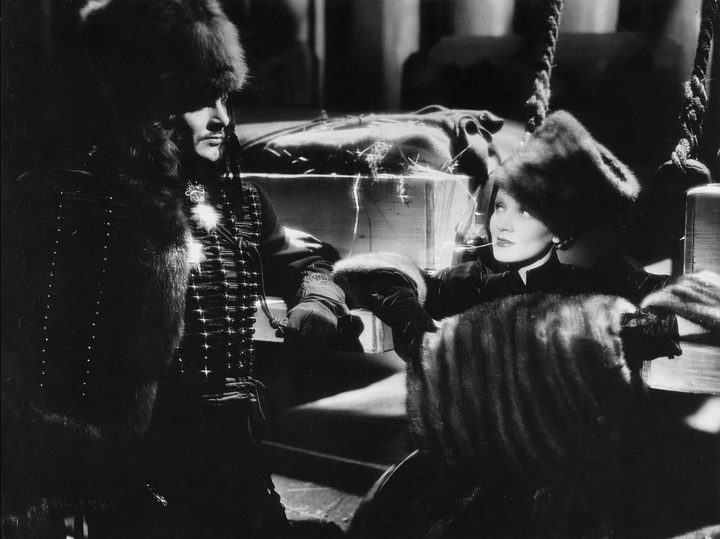 To be frank, The Scarlet Empress is really pretty cavalier with fact and fiction, intertwining more of the latter than the former (despite being rooted in history, the film’s liberties are broad and often unkind), but it matters nought when von Sternberg’s focus is on an overt style. The production design on the film is alternatively low-key and incredibly ornate, although the use of wooden structures for palatial settings avoids stepping into the ostentatious. 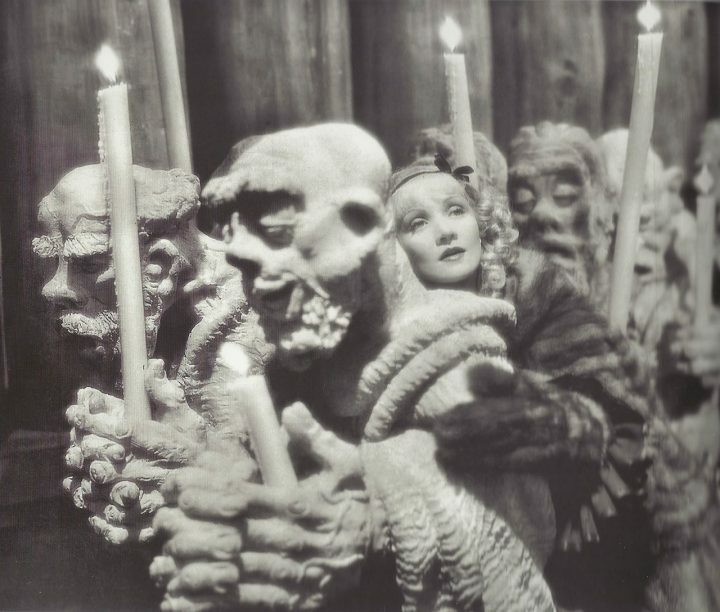 According to this film, Russian interior decorating at the time of Catherine’s life, around the mid 1750’s, was either a plethora of hideous gargoyle-like statues suggesting demonic presence, or rooms filled to overflowing with long stemmed candles, the latter of which must have been a huge fire hazard on set at the time. Candles plus massive dresses and flammable lace makes for tense viewing, to say the least. The sets, from Sophie’s home in Germany to the opulent palaces of Moscow (including the puzzlingly small cathedral in which Sophie and Peter are married) feel weirdly hewn from the forest, rather than constructed in reality, and it’s an interesting choice of design for a film of such magnitude. The oppressive shadows and sense of confinement are a motif following Sophie’s journey to the palace (early scenes with her in her home, over which shadows of gnarled tree branches represent prison bars, suggest a caged bird about to be granted freedom) where her fate moves from a sense of physical imprisonment to an emotional one. 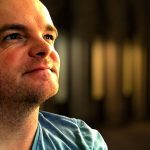 The impenetrable visual tone of the film is crafted by cinematographer Bert Glennon, who had previously worked on DeMille’s 1923 silent version of The Ten Commandments, and who would go on to work with John Ford on Stagecoach and Young Mr Lincoln. Glennon’s photography here is exquisite, thrusting darkness and shadow into this world of Russian aristocracy, making it feel more sinister and lascivious than perhaps it was in truth. Glennon’s lighting and use of focus, especially in Dietrich’s closeups, as well as the numerous darker sequences of the story (a later scene in which Sophie leaves the palace and ventures into the surrounding forest, is hugely memorable for its silhouettes and omniscient darkness) bring the film’s style and dense tones to bear on a viewer unaccustomed to them. Sadly, however, all this style and promise of intrigue is mired by a film devoid of heart. 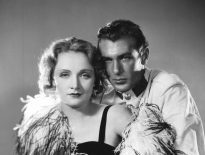 Dietrich’s leading lady has the devil’s job trying to import some emotion to the role, leastways emotion I found rooted in realism. Von Sternberg’s direction vacillates between soapy melodrama and indifferent farce – his treatment of Peter, in particular, feels uncomfortably like the film needed a definitive villain and this was the obvious choice, rather than a natural one – and a complete stretching of historical truth to the point it almost snaps. The Scarlet Empress has all the style and grounding in history it could ask for, and Dietrich’s star was well and truly white hot by this point, but I found the film too stylised for my tastes to overcome thin character development and ineffectual motivations. Louise Dresser is easily the best thing about the film (and when her character dies off, the film becomes a grind), while the solid cinematography and crisp, atmospheric tone employed by von Sternberg’s team makes for an intriguing watch. Unfortunately, my investment in the characters came out wanting. I’m guessing you must have acquired the Dietrich and von Sternberg box set from Criterion? A movie collector friend of mine got it and I borrowed it for a week. I only managed to catch a couple of the films before returning it. I’ve half a mind to pick it up myself, it’s a really, really nice set.